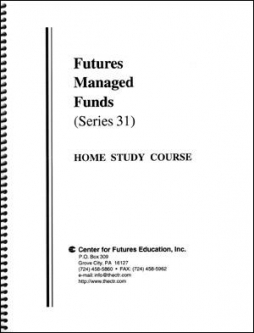 For securities brokers who limit their futures business to futures funds. Passing the Series 31 exam allows registered representatives to receive trailing commissions from their sales of futures fund interests without having to take the Series 3 exam. 10-20 hours of study time is recommended. Registration with the NASD as a General Securities Representative (Series 7) is a prerequisite! No waiting for the course to be shipped to you; your PIN number is emailed to you automatically when you order! Study your course from anywhere in the world where you have internet access! Immediate feedback practice quizzes promptly reinforce correct answers and build confidence as you prepare for the exam. Free Phone/E-mail/Skype Support! If you have questions about our material, the Series 31 Exam, or futures in general we're just a phone call, e-mail or chat away with the answer. With access to our tutor, you have all the tools at your disposal to help you pass the exam! After you order, we e-mail you a PIN number and URL for username and password creation. Once you create your username and password, you have 30 days of access to the course. The Series 31 is composed of 7 Sections, each with its own practice quiz and 2 Final Exams of 45 questions. You receive 5 accesses to each quiz and 10 accesses combined for the two final exams. Each practice quiz and Final Exam is fully interactive. The course features immediate feedback for each quiz question, and final exams where you take the entire exam, then receive a list of questions you missed. For missed questions, you can view the question, your answer, the correct answer, and explanation, all in one window.